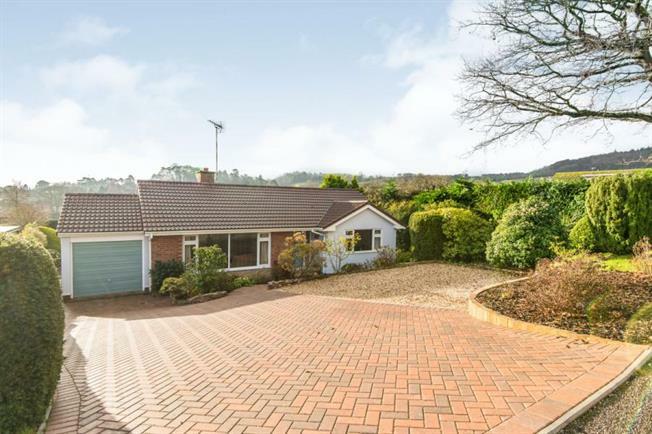 3 Bedroom Detached Bungalow For Sale in Sidmouth for Offers in excess of £500,000. Three Bedroom detached bungalow, recently refurbished to a very high standard. NO ONWARD CHAIN - This beautifully finished detached three bedroom bungalow offers generous southerly facing rear gardens with delightful outlook across the Valley. The property has been extended and extensively refurbished to a superior standard throughout. To the front of the property there is parking for three to four cars. We highly recommend an early viewing. Sidmouth lies on the Jurassic coast at the coastline is dominated by vivid red sandstone cliffs. Along the Regency style seafront is the Millennium Walkway which stretches the length of the pebble beach, providing the perfect location for an afternoon stroll. Sidmouth also offers beautiful country walks by the meandering river Sid in the Byes. Spacious hallway with parquet flooring, loft hatch with loft ladder leading to a part boarded and well insulated loft, telephone point, radiator. Large double glazed windows overlooking the front, parquet flooring, open fireplace set within tiled surround with mantelpiece and hearth, feature wall with floral wallpaper, coved ceiling, one wall light, feature ceiling light, TV point, telephone point, radiator. Dual aspect double glazed windows with far reaching views towards the sea and Salcombe Hill, CRL quartz reflection worktops with modern Dove grey flush finish base and wall units, matching island with breakfast bar, stainless steel sink with drainer and mixer tap, induction hob with extractor, eye level grill and double oven, slimline dishwasher, modern demijohn light fittings with chrome light switches, TV point, radiator, double door opening out to a gorgeous, well planted and spacious south facing garden. Obscure south facing double glazed window, modern white suite with low level WC, panelled bath with mixer tap and shower attachment, modern wash basin with mixer tap and under sink storage, part tiled with stylish rectangular splashbacks, large heated towel rail. Double glazed window overlooking the front garden, coved ceiling, feature wall, radiator. Double glazed window with a gorgeous outlook across the secluded area of the garden towards Salcombe Hill, coved ceiling, feature wall, radiator. Double glazed window to the side of the property, parquet flooring, coved ceiling, radiator. Obscure south facing double glazed window, large rectangular grey tiled flooring, white suite comprising WC, wash basin with mixer tap and under sink storage, 1200mm x 800mm shower tray with mains powered rain shower and glass sliding door, part tiled and heated towel rail. Garage 5m x 2.74m (5m x 2.74m). Up and over door, electric and gas meters, power and light connected, personal door to the rear garden. To the front of the property is a lovely brick paved driveway leading down to the garage with additional gravelled area for parking. There are various attractive herbaceous beds and borders, a side pedestrian gate gives access to the rear garden which is a particular feature of the property taking in a southerly aspect with delightful views towards Salcombe Hill. Within the garden there are a wide variety of shrubs and plants, paved patio, lawn, various herbaceous beds and borders, mature hedging and outside tap.